For the second home game of the weekend Wild faced second placed Telford Tigers, whose only defeat came against table topping Solihull. For the Wild, young defenceman Tom Barry was unavailable but Sam Dunford returned to the team. Wild got off to a great start putting pressure on the Telford defence. They shocked a sizeable crowd by taking a lead at 3.09. After netminder Denis Bell had blocked two shots Chris Preston fired home a rebound to put Widnes in front. Just four minutes later, Widnes were two ahead, Bobby Caunce feeding Filip Supa who fired home at the left post. Telford were starting to show why they are up at the top of the league when Wild took penalties. Eventually after cycling the puck around the Widnes end, Brad Betteridge scored from distance on the powerplay from a pass from Karol Jets at 18.54. Immediately, Wild burst forward and only top saves from Bell kept the score at 2 - 1. The second period opened with sustained attack from the visitors. Their forwards were passing more accurately and skating clear. After several scares and brave saves from Greg Ruxton, Telford found an equaliser with Wild on a powerplay an error controlling the puck saw a Telford breakaway. Top overseas star Karol Jets worked some magic in the right corner. He fed the puck back to James Smith who hammered a straight shot inside Ruxton's left hand post. The game continued end to end and Bell made vital saves as Wild put on pressure A third Wild goal came at 31.59 when Geoff Wigglesworth managed to force the puck over the line. Just before the break Supa broke clear for Widnes only to see his shot saved by Bell. The third period opened with Filip Supa breaking clear only to see his shot saved by Bell. Almost immediately Sam Dunford hit a powerful shot to the top left corner which deflected off the netminders helmet. Wild continued to press and a well planned breakout was called for offside. Ben Brown was the next to skate clear and only desperate defence steered him wide of the goal Lee Pollitt skated clear only to see his long range shot well saved. Greg Ruxton repeatedly foiled Telford attacks with bravery and agility. Pavel Vales was again a rock with Matt Wainwright in a hardworking Wild defence. Telford found themselves shorthanded at 57.46 and soon after Widnes called a time out. Spectators were living on their nerves but Wild held on to record a famous victory. Greg Ruxton took the MVP for Widnes after making many vital saves to secure victory. Bobby Caunce was back to his creative best, prompting the attack with shrewd, well timed passes. 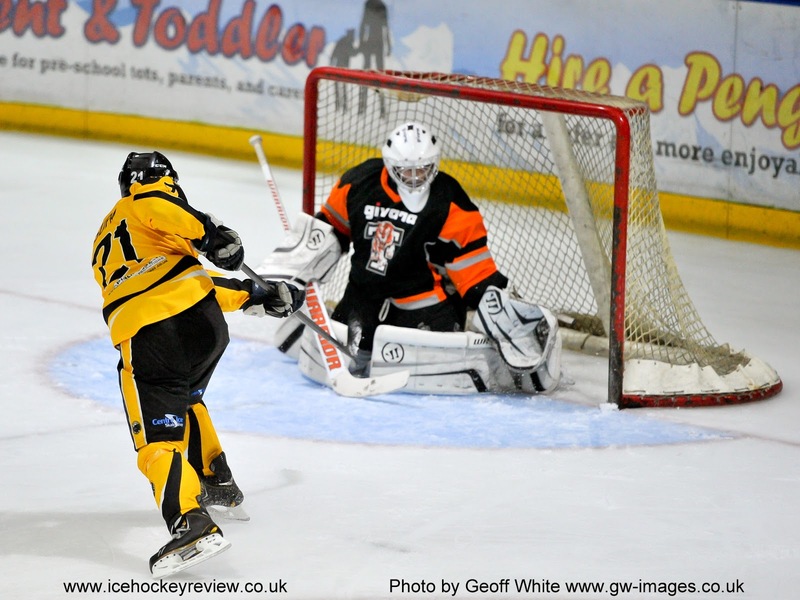 Tigers outstanding young netminder, Denis Bell also kept his team in contention with some great stops. Head Coach, Mark Gillingham was delighted with this victory over one of the frontrunners and spectators can look forward to more of the same when Telford return next week - face off 6.15. A great game is assured and hopefully a full house will be there to see it ! Two victories over the weekend confirms the growing confidence in the Widnes ranks, following the outstanding show in Solihull the previous Sunday. Next Sunday's home game with Telford will see a charity ' Air the Bear' - when spectators can throw the gift of a teddy bear onto the ice, with all bears being donated to deserving local youngsters. Such charity collections are a big seasonal feature in North America. There was a nice touch during Sunday evening’s Most Valuable Player presentation. Two nurses at Whiston Hospital, who dealt with a late night training injury to student defenceman, Kieran Strangeway, were invited to the game by Wild management and made the ice side presentations.